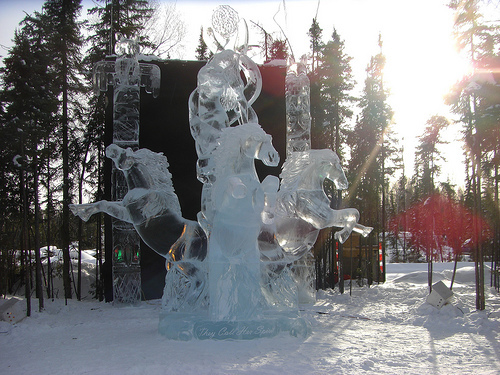 Celebrate the 22nd Annual BP World Ice Art Championships in Fairbanks! This photo is used under a Creative Commons license by jaycross. This year, Fairbanks will celebrate the 22nd annual BP World Ice Art Championships (Feb. 24 – March 30). Founded in 1990, the ice-carving competition is operated by more than 90 different committees, nine board of directors and hundreds of volunteers all across the globe. The competition brings in thousands of people from around the world to view these unique artistic pieces created out of large blocks of crystal-clear ice. The first competition in 1990 was just a week long and consisted of only eight teams. Today, the competition has grown to more than 70 teams of competitors from around the world and is a little more than a month long! Over the years, artists from more than 45 countries have entered the competition, and this month, more than 100 artists will make their way to the “Golden Heart” city of Fairbanks for a shot at being the BP World Ice Art Champion. In the past, organizers ordered blocks of the clear, crisp ice used in the competition from Seattle. Starting in 1998 however, the committee learned how to harvest ice blocks from a local Fairbanks pond. Today, the competition takes place at the George Horner Ice Park, located next to O’Grady Pond Too, a larger pond and ice resource to accommodate the growing event. The event features three competitions and one exhibition each year at the George Horner Ice Park. Competitors in the Single Block Classic event have 60 hours to create their masterpiece after the ice block is put in place, without the help of machinery. The Multi-Block Classic gives artists 132 hours to finish each piece, while the public is invited to watch as expert machinery assists in moving the pieces to fit together. The Youth Classic is an opportunity for high school students to show off their developing skills and create a piece with the assistance from experienced artists, who help to answer questions and address technical issues. For ice sculptors looking to have a little fun apart from the competition atmosphere, the Amateur Open Exhibition is available for those wishing to work on some big ideas of their own. In addition to the magnificent ice sculptures, the park also features an ice playground with slides and rides built out of ice, providing unique fun for the whole family. For those looking for the quintessential Alaska cultural experience, the event also offers VIP tours of the park via dog sled rides. The ice park is open 10 a.m. to 10 p.m. daily until the end of March, though the most popular time to visit is around March 8, right after the sculptures are complete and in their best condition. Come out and support local and international ice artists next month with a trip north to Fairbanks!